Academic Integrity is one of the pillars of academia, but are you completely sure you haven’t plagiarized when you turn in a project? 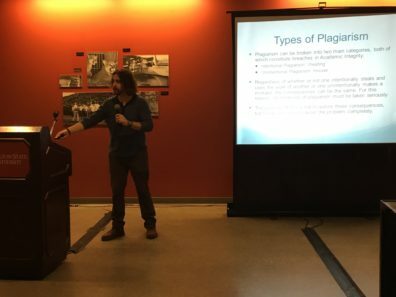 The Academic Integrity Workshop aims to provide students the information they need on WSU’s academic integrity policies before then exploring some of the core issues that surround plagiarism. During this session the Graduate and Professional Writing Center will share strategies and ideas to make sure you know how to avoid plagiarism and how to identify issues of plagiarism.